If you have ever lived in a hostel you will definitely agree with me that being there is not at all easy. Surely Hostel life means funny times with friends, those late night chats with snacking with mathri and pickle or tiptoeing to the kitchen to make maggi during exam times midnight hungers hen you will remember, or whole day out with gang of friends with food and laughter. But if we keep those factors aside then am hardly ever have met anyone who never cringed their nose during meal times. Remember those watery dals, salt-less or overtly salty mass of veggies and ‘that’s the best you can get’ attitude of the canteen staffs? In our case the food was worse as the hostel was run by an ex Colonel. Who believed that food should be healthy and seasonal. Which literally translated into buying the cheapest vegetable from the market and boiling it with salt and minimum spices. In winter either it was a huge bowl of mushy carrots with little salt or a runny cauliflower- potato mash where it was difficult to differentiate between the two vegetable. I still remember the very first meal I had there with the overtly salty fried bitter gourd, bland toor dal and charred rotis. I somehow managed the first few days but later on those unbearable days we started to make our way to the paid canteen to have simple dal-chawal or egg toast. The meal time was extra painful as in the second half the boys will start teasing us with what great food they had at their canteen. Their canteen was run by an ex team member of a famous Chef who clearly understood how to combine the three factors of nutrition, taste and seasonal availability. The only days when we wanted to reach the canteen early were on Wednesday and Sundays. Wednesday for lunch they used to serve kadhi pakoda. Hailing from a traditional Bengali family I never had this dish but my roomie coaxed me to have it and I loved the slightly tangy and spicy gravy with my rice. Since then I have been making this again and again and was elated to have found another kadhi lover in my husband and recently in my son. The recipe I am sharing here is based on a recipe shared by someone in an Orkut food group, with time I made slight changes here and there but it works for me everytime. This is purely optional but gives the whole thing a nice final flourish with reddish hue. Peel and wash the potato and onion. Cut the potato in very fine julienne. Chop the onion very finely in half moon shape. Take the onion, potato, chopped spinach to a big bowl. Add pinch of salt, turmeric and chilli and mash with your hand for a couple of minutes. The veggies will start releasing water. Now mix in the chickpea flour little by little and mix with your hand. Try to coat all the veggies with the chick pea flour. If needed add more (depends on the quality of your veggies). Finally add 1 or 2 tbsp water to combine everything together. It should not be runny rather you should be able to give it shape yet the chickpea batter should coat the veggies nicely. Check the salt and add more if needed, add the soda. Keep aside. Heat enough oil to deep fry in a heavy bottom pan. Carefully drop spoonful of batter (I prefer to make them round using my hand) in the hot oil. Do not over crowd the pan. Fry on medium flame till golden on all sides. Take out with a slotted spoon and place on absorbent paper. Mix in the besan with the water till smooth. Beat the curd smooth and add to the water. Mix in the turmeric and salt and keep aside. Heat the oil in a big pan. Carefully tip in the fenugreek, cumin, mustard seeds and dry red chillies. It will splatter a lot so be careful or cover with a splatter gourd. Once you smell the nice aroma add in the hing (asafoetida) to this. Stir for a second and add the yogurt-besan mixture. Now comes the difficult part of stirring the mixture continuously as the flour will thicken the sauce so there definitely is a chance of getting it burnt at the bottom. Keep the flame on low and keep stirring for next 5-7 minutes or the sauce gets thickened. Finally add the pakoda’s and cook it for 2-3 minutes. I do not cook it for more as soggy pakoda’s are not my idea of perfect kadhi. What I prefer is soft and sauce soaked Pakoda with intact shape. Switch off the flame and cover. For the final flourish or temper, heat the oil in a small pan. Crackle the seeds and dry red chillies. Switch off and mix in the red chili powder. Pour it immediately over the prepared Kadhi. Cover and keep aside till you are ready to serve. This tastes best with hot steamed rice. I prefer to pair Kadhi chawal with simple fried potato and microwave roasted papad. 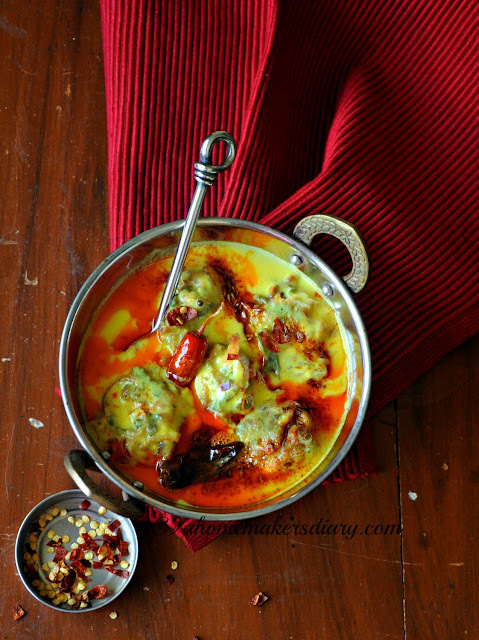 Kadhi tastes best when warm or piping hot. If you do not intend to serve it immediately then prepare the kadhi and pakodas separately. 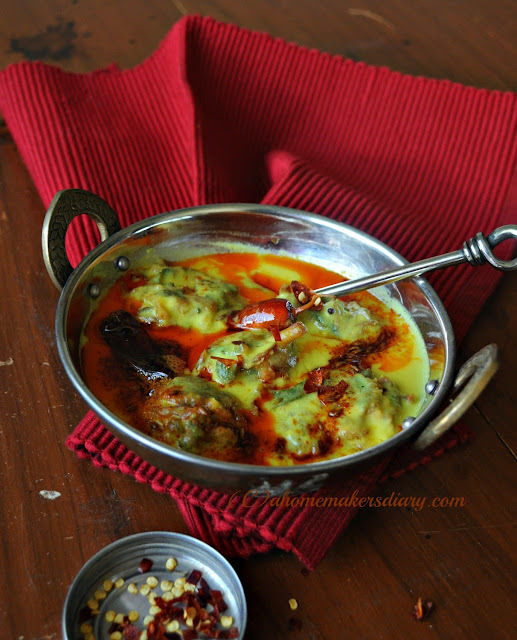 Just before serving re-heat the kadhi/bring it to boil, dunk the pakodas and do the tadka. In that case you might will like to keep the prepared kadhi little thinner than you like as reheating will thicken it further. If the Kadhi does not get thicker then mix another spoonful of chickpea flour to 2 tbsp water, beat it smooth and add. This might happen depending on the variety and quality of the flour. For any leftover let it come to room temperature and save in an air tight container in the refrigerator. To Dish it out:onion and chillies at Krithi's kitchen, originally started by Vardhini. To Walking through Memory lane at Avika's page, the event is originally conceptualised by Gayathri. 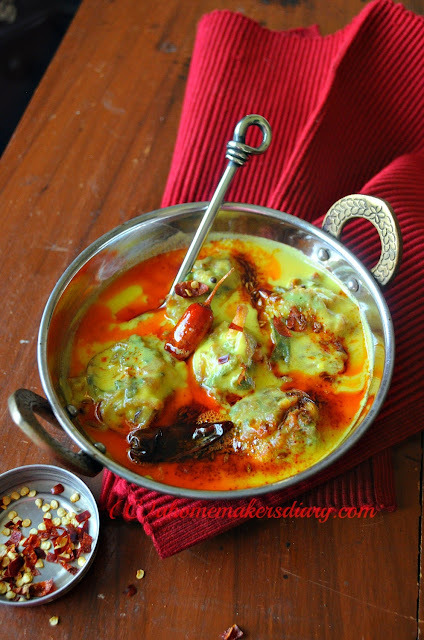 kadhi pakora looks stunning. Gorom bhater sathe byapok lagbe. Beautiful click. 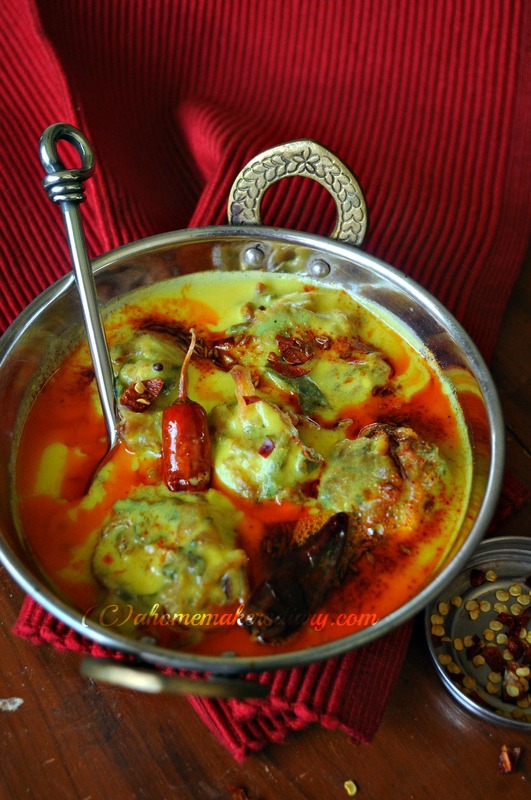 Lovely pictures, kadhi pakora looks fantastic. Thanks for the visiting and kind words. you also have yummy blog. keep in touch. BTW pakora kadhi looks so tempting specially that tadka on top. Your pictures itself speaks a lot, wat a comforting kadhi, that too with pakoda, my fav food. Thank you so much for stopping by my space. Wow u have such a beautiful collection of recipes. Kadhi pakoda looks really yummy. Beautiful photos and they make me hungry! I think I even have everything required to make this too. Lovley stepwise explanation.. thanks for linking to the event..